All four major U.S. cellular carriers support Wi-Fi Calling on iPhones. Here’s how you can turn on this feature on supporting networks. 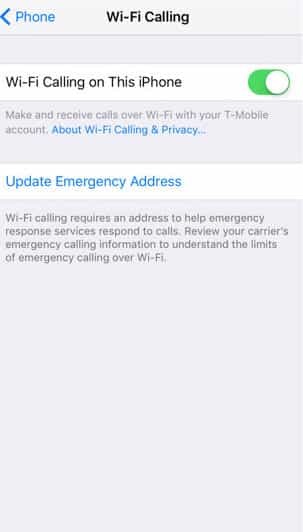 In the wake of Hurricanes Harvey and Irma, it is useful to know how you can activate Wi-Fi calling on your iPhone. This could make a difference in an emergency situation for you or people you care about. Supporting Wi-Fi calling is simple for iPhones. Just go into the iOS Settings app (Gear icon on a gray background) and toggle the Wi-Fi Calling switch. After you turn it on, the iOS will ask you to provide an emergency address. This is done to help emergency responders help you since Wi-Fi alone can be difficult at times to pinpoint a location. In most cases, your iPhone will first attempt to make an emergency call over cellular. After you have enabled Wi-Fi calling on your iPhone and you are connected to a Wi-Fi network, the system will automatically reroute both incoming and outgoing calls over the Internet. You can use your regular phone number with the service. You do not need to remember a special access number or download a special app to use the service. 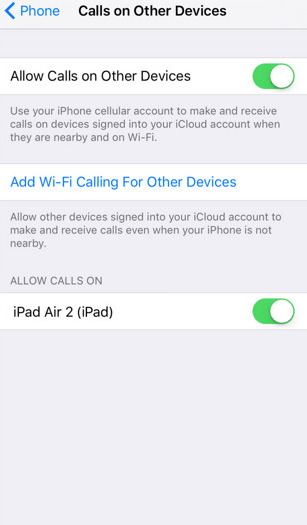 After you enable Wi-Fi calling, you can also make or receive calls from any other Apple devices such as Macs, iPads, iPods or Apple Watches that are linked to your Apple ID on your iPhone. Just go into the Phone menu (Phone icon on green background) in your Settings app and go to the Calls on Other Devices section. Press Allow on Calls on Other Devices. This is immediately activated for your Apple Watch if you have one. However for iPads and iPods, you will need to go to the Settings App and select Calls from iPhone under the FaceTime Menu. Press Upgrade to Wi-Fi Calling. You must then log in using your Apple ID that is available on all these devices and enter a six-digit passcode on your iPhone when you are prompted to do so for authentication. After you have set it up for all your necessary devices, you can easily enable or disable any individual device by visiting the iPhone’s Calls on Other Devices section again and turning settings on or off for each device listed. AT&T first offered Wi-Fi calling in 2015 and expanded it to international Wi-Fi calling since last year. Given how international phone charges can quickly rack up, AT&T subscribers benefit from international Wi-Fi calling that helps avoid roaming charges when you travel. In addition to lowered costs, Wi-Fi calling is useful in places that have poor quality cellular coverage. This feature is available in many parts of the world but currently restricted (June 2016 data) in China, Cuba, India, Iran, Israel, North Korea, Pakistan, Saudi Arabia, Sudan, Syria, Turkey, the United Arab Emirates and Vietnam.